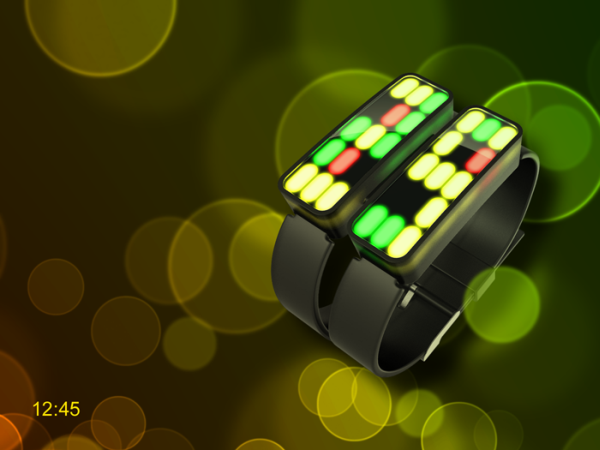 This Fusion LED watch design brings a new twist to the way LED watches are being designed. It’s not a one-dial hefty watch but it comes with two dials. One dial is there to show minutes and days while the other one shows hours and months. Well, the design is not that appealing and attractive especially for guys but the concept is good. The watch, designed by Samuel from Germany, is said to be a one of its kind watch. I agree with that statement because we haven’t seen anything like it before. What’s so unique about the watch? 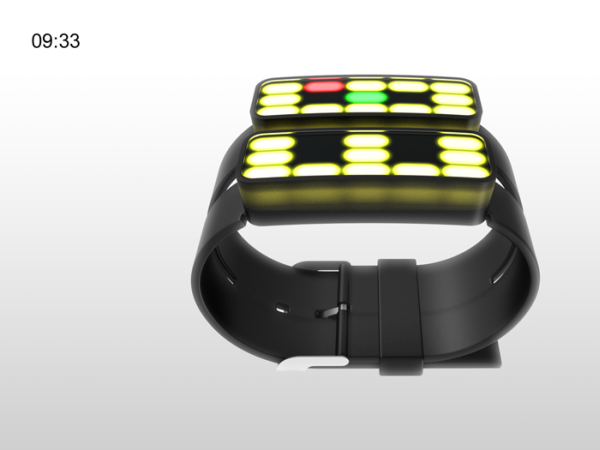 First and the foremost, the good part about this watch design is that the lights create digits which make reading time and date easier unlike in most of the LED watches. 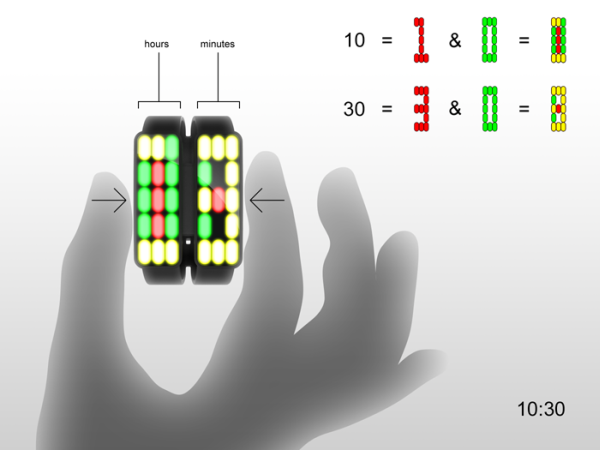 Time and other information are displayed within a 3×5 LED dot matrix. Now here’s the catch, they don’t separately show you hours and minutes instead each dial has superposed digits. So you need to use your loaf a bit and figure out the time. It’s not all easy with LED watches after all. The first digits in both the dials are displayed in red color while the second digits are displayed in green color. The yellow lights display the intersection between both the colors. The straps of the watch are soft and are matte black. Even the dial is matte black which gives the watch a chic appearance. 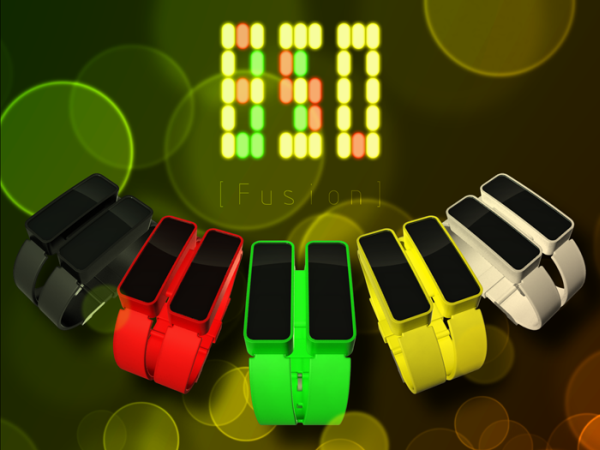 Due to the fact that the straps are soft, you can easily wear them without worrying about hurting your wrist. The watch is perfect for? Well I personally think the watch is perfect for people who love going to dance floors. Of course you can’t wear this watch on formal occasions but it for sure can be a great watch on the dance floors. The glowing lights and the way it has been shaped can really make others drool over it while you are dancing like a duck! It is a unisex watch so even girls can wear it or maybe they can borrow it from you for some time? Anyways, the watch concept is good so we should give Samuel a big round of applause! Good job Samuel! 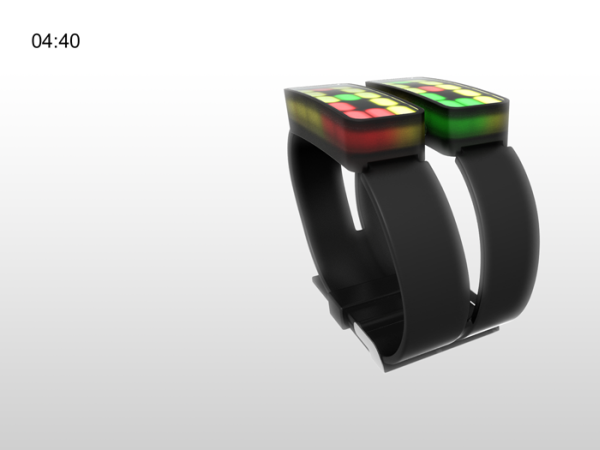 Check out some more concepts here: The Simple Yet Stylish LED watch and The Unisex Watch Design. Thanks for posting my concept here!